This is just a simple demonstration of how you can delete duplicates using CTE (Common Table Expressions) and the ROW_NUMBER() ranking function. One approach to deleting a duplicate is to first assign sequential numbers that get reset for each group of unique records. 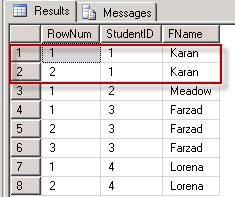 We can do this by using the ROW_NUMBER() function and specifying a PARTITION BY clause. The columns in the PARTITION BY should identify the unique records in your table. 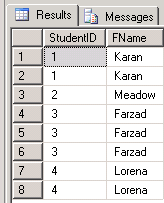 In the example below, it is enough to specify StudentID. If we were to select from this CTE, this is what you will get. Notice RowNum = 1 is repeated for every new instance of StudentID.